Shapes Pair of winged samaras 2–3 cm long with a 6–8 mm seed. 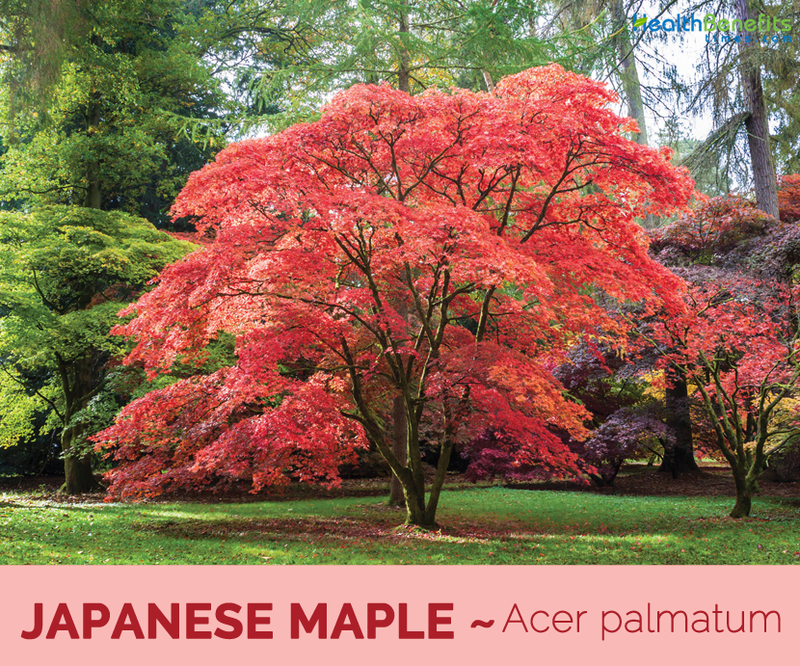 Japanese maple scientifically known as Acer palmatum is a member of the Aceraceae family native to Japan, North Korea, South Korea, China, eastern Mongolia, and southeast Russia. 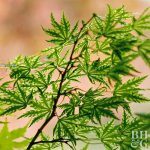 Apart from Japanese maple it is also known as Japanese maple, Smooth Japanese maple, Blood leaf Japanese maple, Green Japanese Maple, palmate maple. It is a deciduous shrub or small tree (generally 6–10 m tall) with low branches and a rounded to dome-shaped crown. 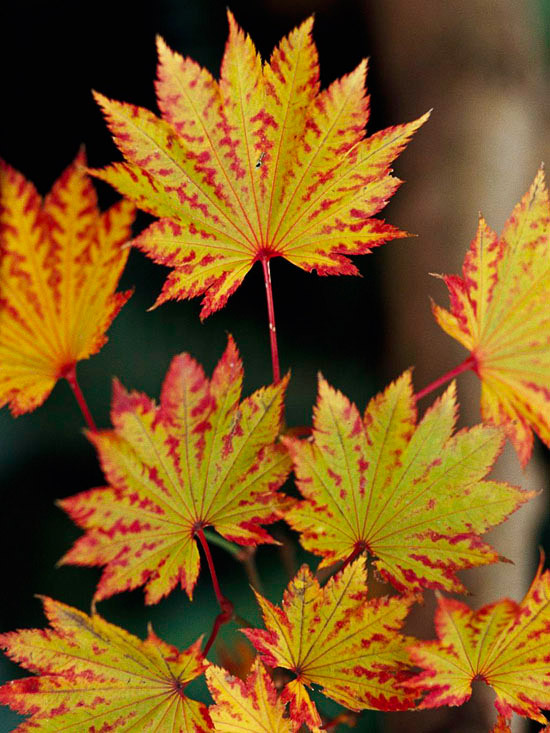 Many different cultivars of this maple have been selected and they are grown worldwide for their dramatic leaf shapes and colors, and are widely used in bonsai. 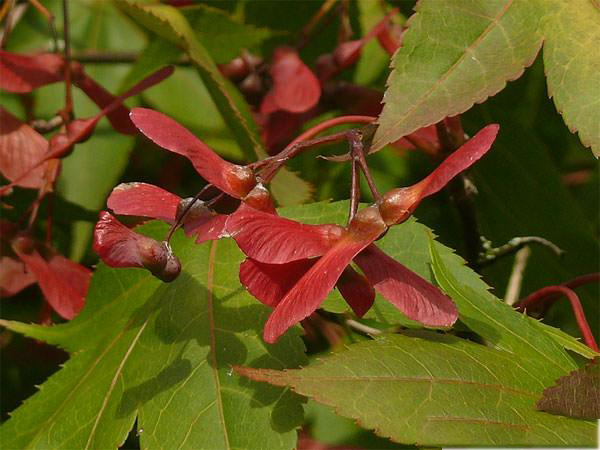 It is one of the most versatile small trees for use in the landscape. It occurs in a multitude of forms that provide a wide range of sizes, shapes, and colors. 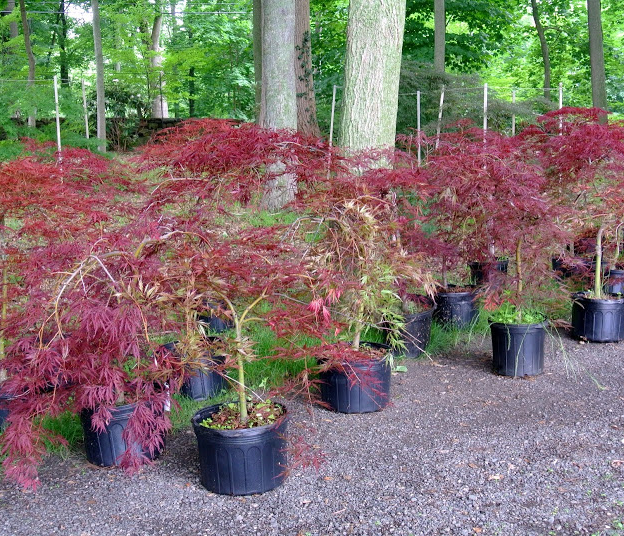 Japanese maple is a wonderful specimen or accent plant and performs well in a grouping or in a shrub border. Japanese maple is a deciduous shrub or small tree that grows about 6–10 m, rarely 16 m tall. 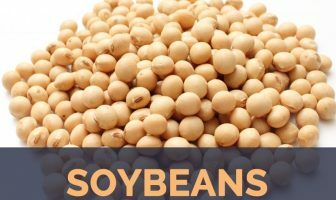 It grows in moist, organically rich, slightly acidic, well-drained soils. General plant form is rounded to broad-rounded, often with low branching. The plant has dense and fibrous root and Smooth, light gray bark, with a somewhat grooved trunk. 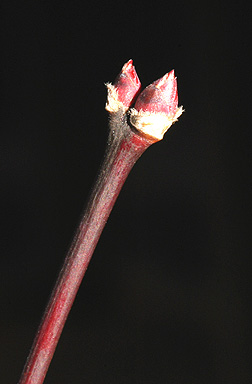 Twigs are slender, glabrous, red or green; buds broadly conical, green or red, base of bud hidden by tan, fuzzy fringe. Leaves of the species form are oppositely arranged, hand-shaped, 2 to 5 inches long and have 5 or 7 lobes. Leaves emerge in early spring. Summer color is green and autumn color varies from orange to yellow to red to purple. The species is monoecious, having both male and female flowers on the same plant. The flowers are inconspicuous and small, and hence do not attract insects. They are produced in small cymes; each the individual flowers has five red or purple sepals and five whitish petals. Flowers bloom between May and June and are insect pollinated. Flowers are followed by a pair of winged samaras (nutlets with stiff, fibrous, papery wings that aid in wind dispersal). Each samara is 2–3 cm long with a 6–8 mm seed. Samaras ripen between September and October and are dispersed by wind. Fall color includes shades of yellow, red-purple and bronze. Cultivars (often grafted) are quite variable. 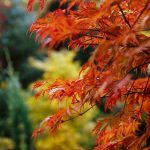 Japanese maple has been grown in temperate areas around the world since the 1800s, but had been grown in Japan for hundreds of years. The first specimen of the tree reached England in 1820. 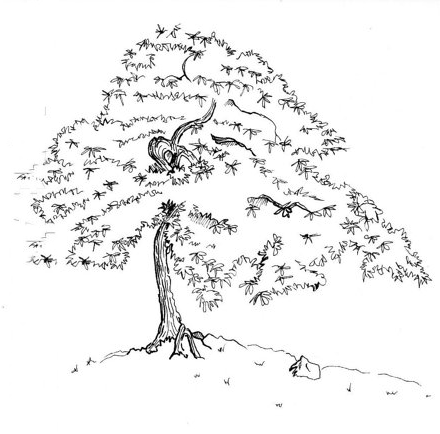 When Swedish doctor-botanist Carl Peter Thunberg traveled in Japan late in the eighteenth century, he concealed out drawings of a small tree that would eventually become identical with the high art of oriental gardens. He gave it the species name palmatum after the hand-like shape of its leaves. This would barely surprise the Japanese who for centuries referred to their group of maples as kaede and momiji, references to the ‘hands’ of frogs and babies, respectively. 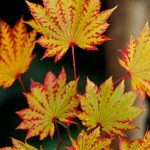 For centuries Japanese horticulturalists have developed cultivars from maples found in their country and nearby Korea and China. They are a popular choice for bonsai enthusiasts and have been used throughout the history of the art. Today numerous cultivars are readily available commercially and are a popular item at garden centers and other retail stores in Europe and North America. 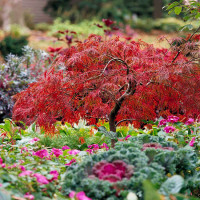 Red-leafed cultivars are the most popular, followed by cascading green shrubs with deeply dissected leaves. 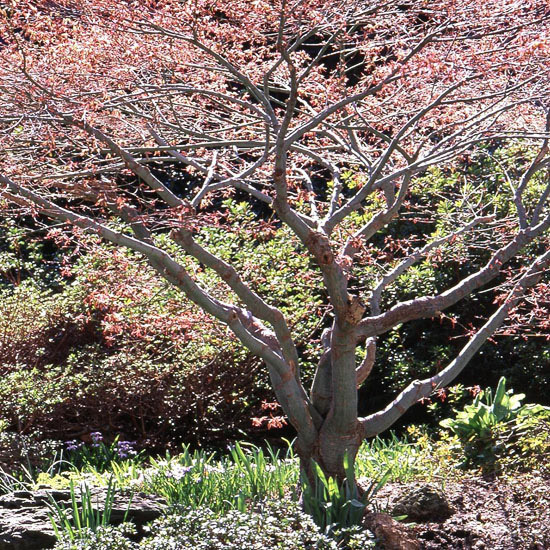 Japanese maple trees add grace and beauty through the seasons. 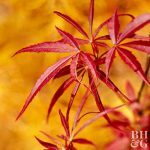 While the Blood good Japanese maple is a tried-and-true specimen, consider some of our preferred varieties, including dwarf Japanese maple, that feature a spectacle of vibrant leaf color. 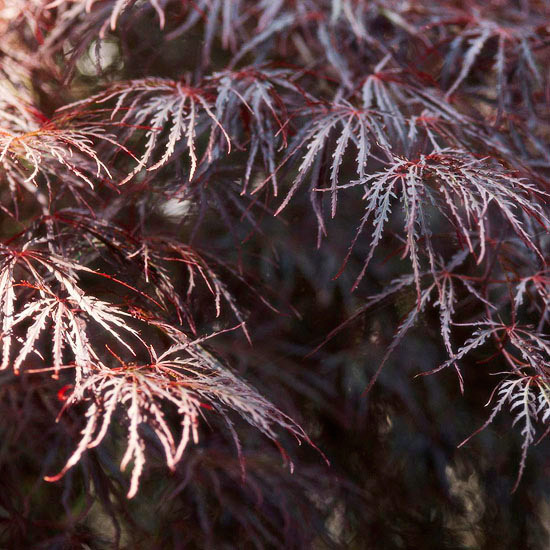 This classic Japanese maple variety bears deeply cut, feathery red-purple leaves that turn bright crimson in fall. The plant has a graceful, weeping habit. It is found growing in part shade and moist, well-drained soil. 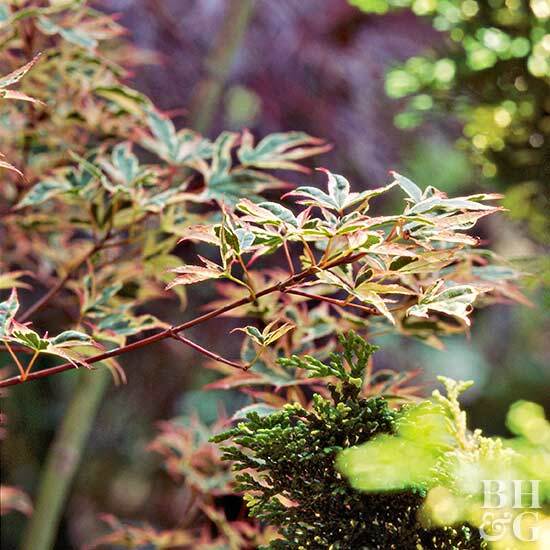 In spring, this dwarf Japanese maple reveals its pink-tinged leaves. 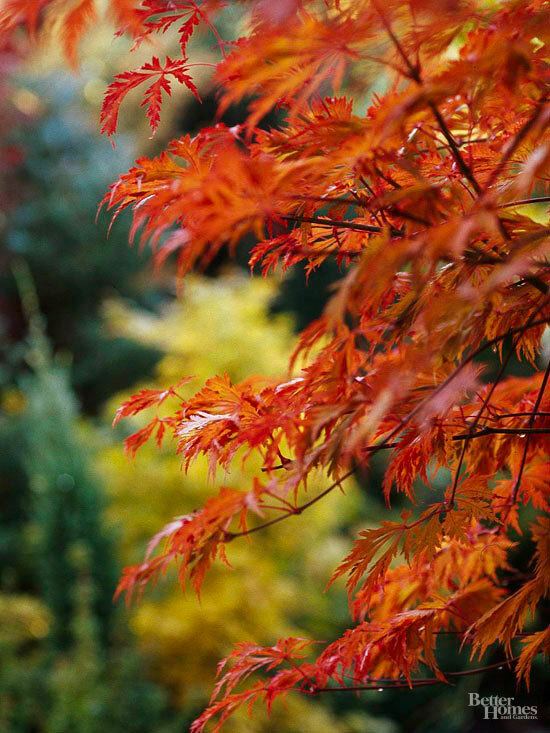 The pink tinge fade away in summer, but then in fall the Japanese maple leaves turns a brilliant shade of orange-red. 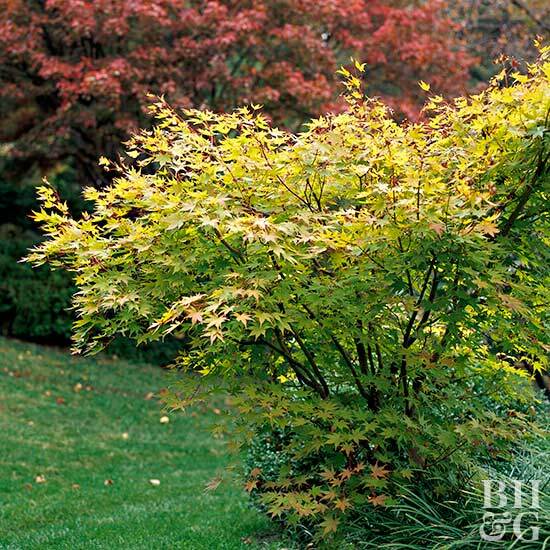 Because of its small size, this maple is well-suited to containers. It grows well in part shade and moist, well-drained soil. 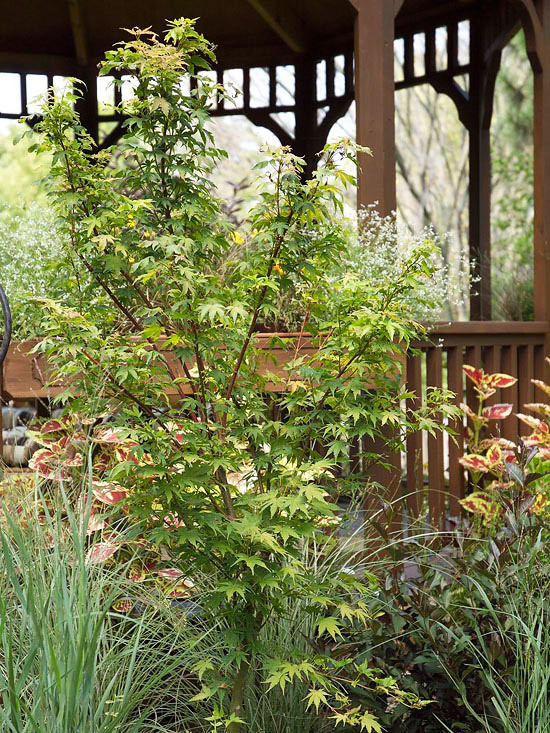 This full moon Japanese maple offers lustrous finely cut green foliage and a subtle weeping habit. If not staked, it forms a flowing mound of foliage. 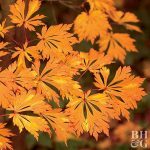 In fall, the Japanese maple leaves turn shades of red and orange. It grows well in part shade and moist, well-drained soil. Like the golden full moon Japanese maple, this Japanese maple features golden leaves. But on this variety, the leaves bear absolutely pink tones. 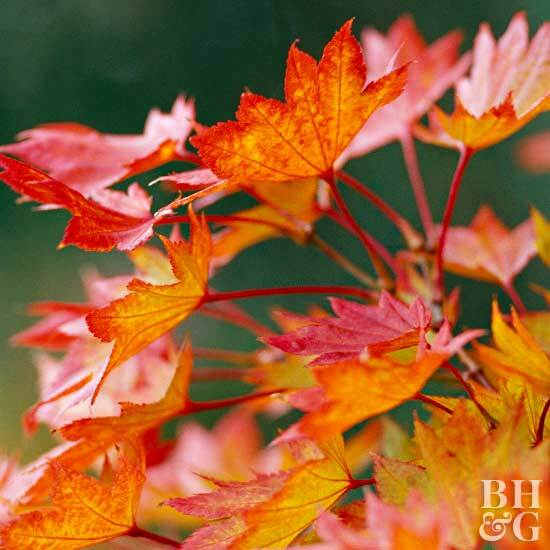 In fall, these Japanese maple leaves put on a show in shades of red, orange, and yellow. It grows well in part shade and moist, well-drained soil. Great time-tested selection, this mid-sized Japanese maple tree bears rich-green leaves that turn bright orange in autumn. It’s robust and tolerates heat better than many other varieties. It grows well in part shade and moist, well-drained soil. 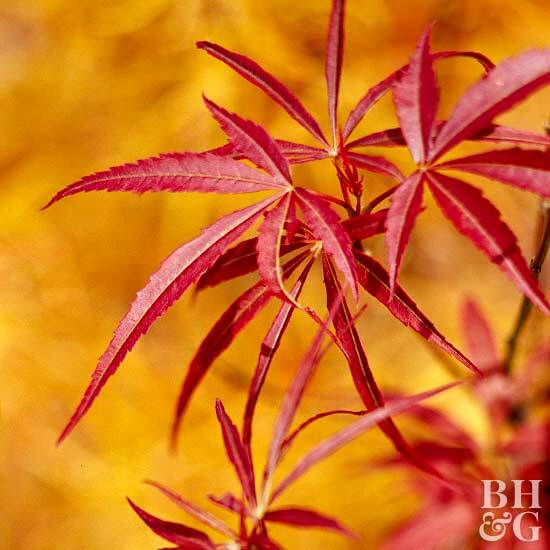 An exceptionally beautiful plant, this Japanese maple tree features golden-yellow leaves through the summer. 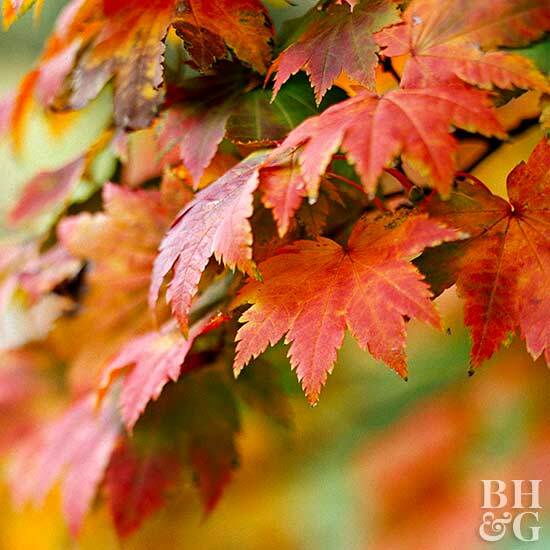 In fall, the leaf tips develop red edges while the leaf center stays golden. It grows well in part shade and moist, well-drained soil. 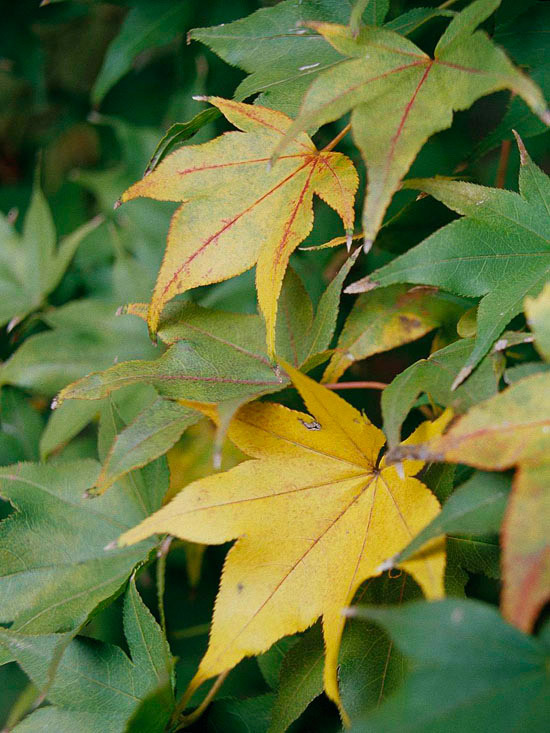 This Japanese maple features small green leaves that turn golden-yellow in fall. In winter, the plant really shines because of its clear-red stems. They look stunning against a backdrop of snow. It grows well in part shade and moist, well-drained soil. Preferred for bonsai, this dwarf Japanese maple tree offers pink buds that open into leaves colored in cream, green, and fuchsia. 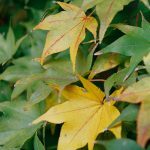 As the season progresses, the Japanese maple leaves fade to green, then change to glowing shades of gold and yellow in autumn. It grows well in part shade and moist, well-drained soil. 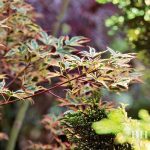 Japanese maple tree Emperor 1 is also a good choice for northern gardens as its leaves open a bit later than most — helping it avoid late spring frosts. It also offers brilliant scarlet-red fall color. It grows well in part shade and moist, well-drained soil. 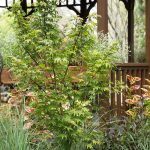 Good-sized Japanese maple tree with multi-season appeal, ‘Sango-kaku’ features green leaves that turn brilliant yellow in fall. After the leaves drop, the stems show off a bright coral-red color. It grows well in part shade and moist, well-drained soil. 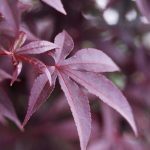 This big red Japanese maple tree variety offers deeply cut leaves and rich, purple-red foliage that looks good all spring and summer. 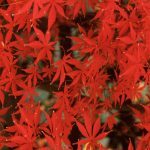 In fall, the graceful leaves turn bright crimson. It grows well in part shade and moist, well-drained soil. 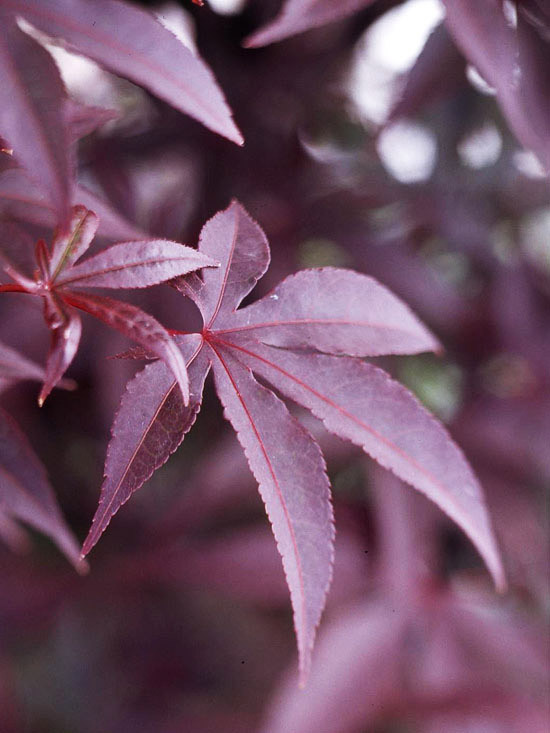 Japanese maple ‘Bloodgood’ offers deeply cut, purple-red leaves that hold their color well through the summer. 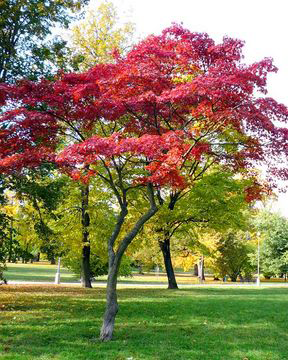 Then in fall the tree develops striking crimson-red color. It grows well in part shade and moist, well-drained soil. 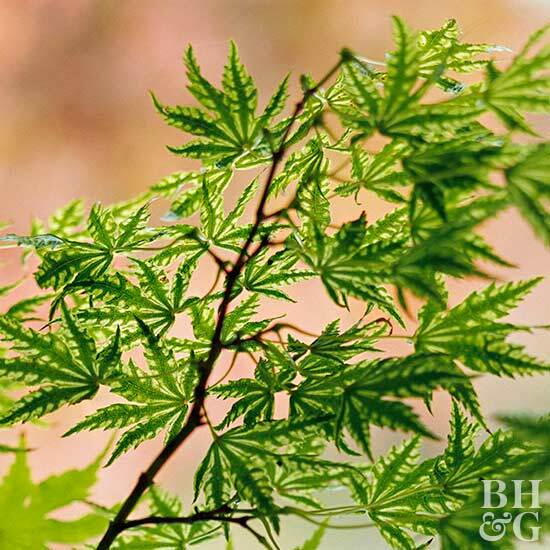 This eye-catching variety of Japanese maple tree offers deeply cut, spidery leaves that emerge pink in spring, and then fade to bright green in summer. In autumn the leaves again change — this time to beautiful golden yellow. It grows well in part shade and moist, well-drained soil. 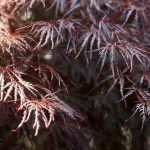 This spectacular variety of Japanese maple offers weeping branches of beautiful crimson-purple foliage. 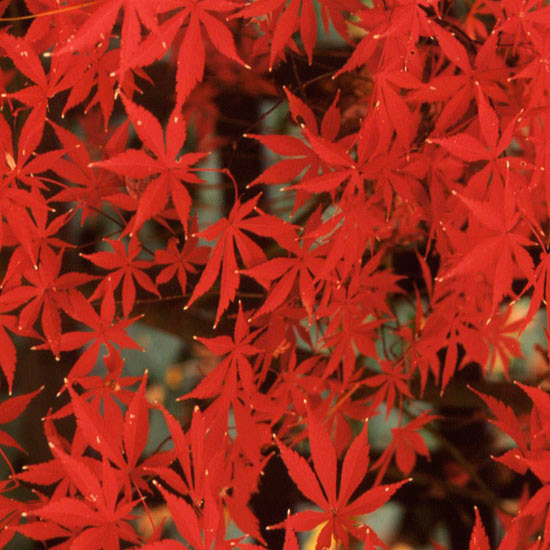 In autumn, the finely cut leaves turn bright crimson. It grows well in part shade and moist, well-drained soil. 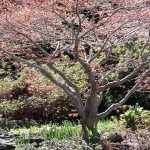 Smaller Japanese maple tree, this stunning variety offers blue-green leaves variegated in shades of pink and cream. In fall, they change to exciting shades of orange and gold. It also tends to resist leaf scorch from hot, dry weather better than many varieties. It grows well in part shade and moist, well-drained soil. 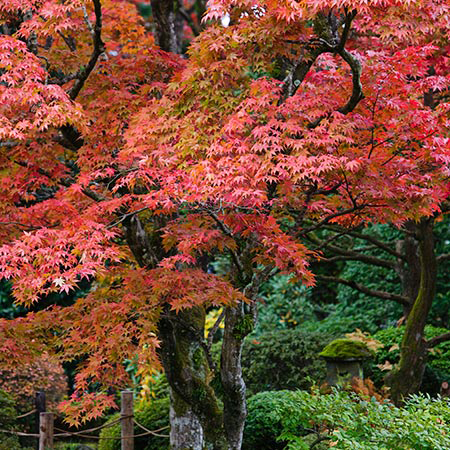 It is one of the most beautiful Japanese maples. 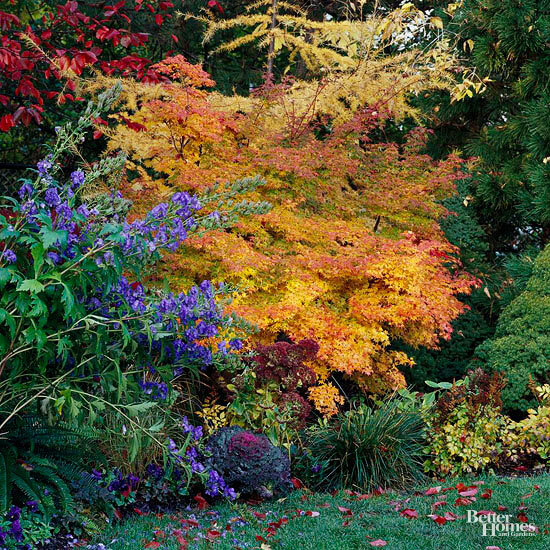 It offers deeply cut, almost ferny foliage that opens to green and turns shades of red, orange, and yellow in fall. It grows well in part shade and moist, well-drained soil. 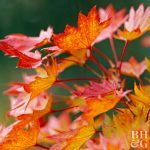 This small, slow-growing Japanese maple tree offers pink-tinged new growth that fades to green as the season progresses. Then in fall, the green leaves turn a nice shade of warm, glowing gold. It grows well in part shade and moist, well-drained soil. 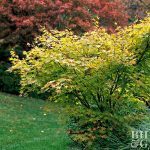 Big, sturdy Japanese maple tree, this variety offers wide, deep green leaves that turn bright shades of gold, yellow, orange, and scarlet in autumn. It grows well in part shade and moist, well-drained soil. Modern research has shown that there is something to the traditional uses of Japanese maple. The leaves are rich in tannins with anti-inflammatory, antimicrobial and astringent action. With these three activities going on simultaneously, it is easy to see why it has long been used to treat eye infections; allergy caused watery eyes, tired, burning, sore, overworked eyes, indeed any condition marked by inflammation of the eye. Flavonoids and potassium contained in the various parts of this tree improve liver function. 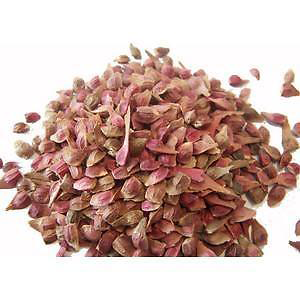 Research has shown the bark contains rhodendrol which has been shown to powerfully improve liver function. 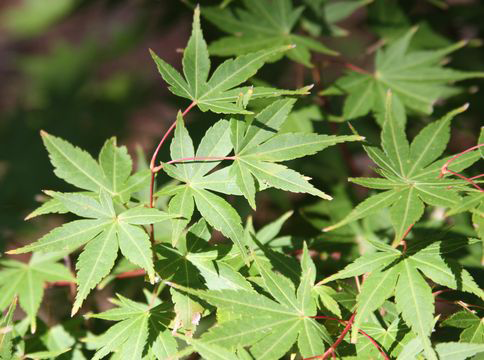 In animals with artificially induced liver damage, liver function improved after administration of an extract of Japanese maple! Leaves, twigs, and bark have been used to remedy eye conditions for at least four hundred years, but, its folk uses predate this. An infusion of the bark, twigs, and leaves were used externally to treat inflamed eyes, infected eyes, sties, and the eye complaints associated with aging (discharges, sore eyes, hazy vision, etc.). Drinkers use it to protect their livers from drink related damage. Sap contains a certain amount of sugar and can either be used as a drink, or can be concentrated into syrup by boiling off the water. Syrup is used as a sweetener on many foods. Leaves are packed around apples, root crops etc. to help preserve them. Leaves feel similar to paper and are used to make bouquets in Japan. 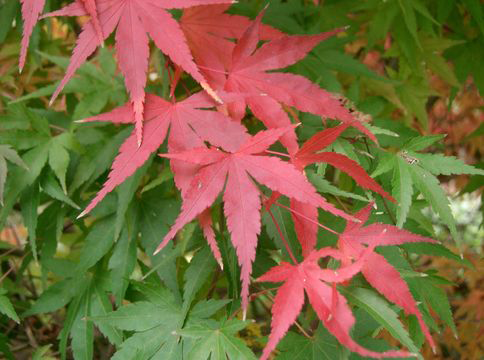 On the Chinese calendar, October is represented by Japanese maple leaves. 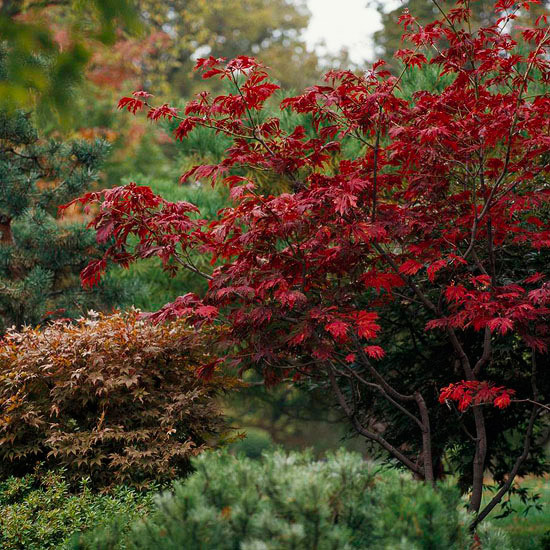 Japanese maple has long been cultivated in Japan and was introduced into cultivation in Europe in the early 1800s. Wood of maple is used in the industry of music instruments for the production of violins, viola, guitars and drums. 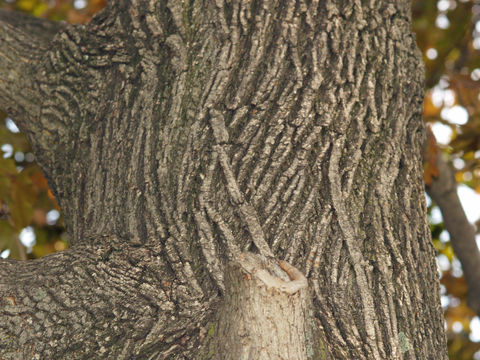 Different types of furniture, baseball bats, bowling pins and butcher’s blocks are often made of maple trees. Dried wood of maple tree can be used for smoking of food, while charcoal made of maple tree plays significant role in the manufacture of Tennessee Whiskey. Maple tree is also used in the paper industry. Paper made of maple tree has excellent printing properties. French: Érable du Japon, Érable japonais lisse, Érable palmé. Portuguese: Ácer-de-cordão, Ácer-japonês, Ácer-palmato, Ácer-redondo-verde, Ácer-roxo. Fruit Shape & Size Pair of winged samaras (nutlets with stiff, fibrous, papery wings that aid in wind dispersal). Each samara 2–3 cm long with a 6–8 mm seed. Lifespan More than 300 years under appropriate climate conditions. Pregnant and breast feeding mothers should keep away from Japanese maple as its contraindications and adverse reactions are not known. Acer palmatum f. caudatum Schwer. Acer palmatum f. cuneatum Schwer. Acer palmatum var. dissectum (Thunb.) Miq. 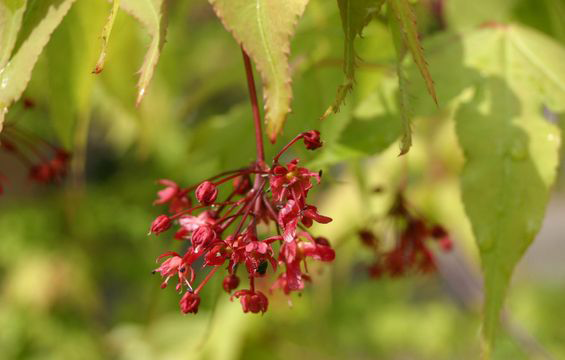 Acer palmatum f. friederici-guillelmii (Carr) Schwer. Acer palmatum f. hessei Schwer. Acer palmatum f. laciniatum Schwer. Acer palmatum f. lineare Schwer. Acer palmatum var. linearilobum Siebold & Zucc. 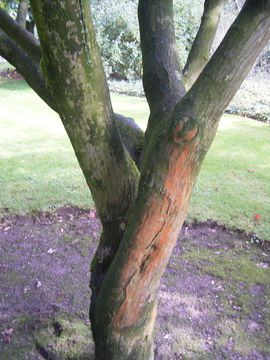 Acer palmatum f. versicolor (Van Houtte) Schwer. Acer palmatum f. volubile Schwer.